Jeans: every guy needs them, but not every guy can find the perfect pair. That's where we come in. 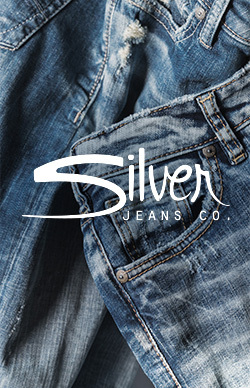 Since 1991, Silver Jeans Co. has set the standard for quality denim with handcrafted details and one-of-a-kind washes. Today, our heritage lives on through revolutionary new fits and innovative fabrics, designed for maximum comfort and superior style. With fits ranging from slim and streamlined like Konrad and Taavi, to perfectly relaxed like Grayson and Gordie, there's something for every preference and lifestyle. Along with our extensive collection of fits, our men's jeans are available in a range of leg options, including slim, straight, bootcut and tapered. We even have denim shorts for those hot summer days. Each available in countless washes, from light indigo with distressing, to a clean dark rinse and even black denim, you're guaranteed to find the perfect pair. Here at Silver Jeans Co., we know that fit is important, but we also know that fabric plays a significant role in finding the perfect jeans. That's why our men's denim collection has three different fabrics to choose from with varying levels of softness, stretch and mobility. Our Serious Comfort category has just a bit of stretch for a laid-back, comfortable feel. This is the old school, traditional denim we all know and love, but with a little added stretch that only you will know is there. Next up is our Superior Flex denim, which is specifically designed to never bag out or sag at the knees. These jeans are made from lightweight denim that has amazing recovery, so they can stretch without stretching out. Our Ultimate Comfort fabric is just what it says—our softest, most comfortable denim yet. These jeans have the look of traditional denim on the outside and the feel of your favorite sweatpants on the inside. So, whether you're looking for an everyday jean to lounge in around the house, a rugged, durable pair made for adventures, or sleek, dark-wash denim to take the place of your dress pants, we've got you covered. Plus, we're constantly updating our men's denim collection, so keep checking back each season for our newest pairs. It's official: finding #TheGreatestJeans just got easier.